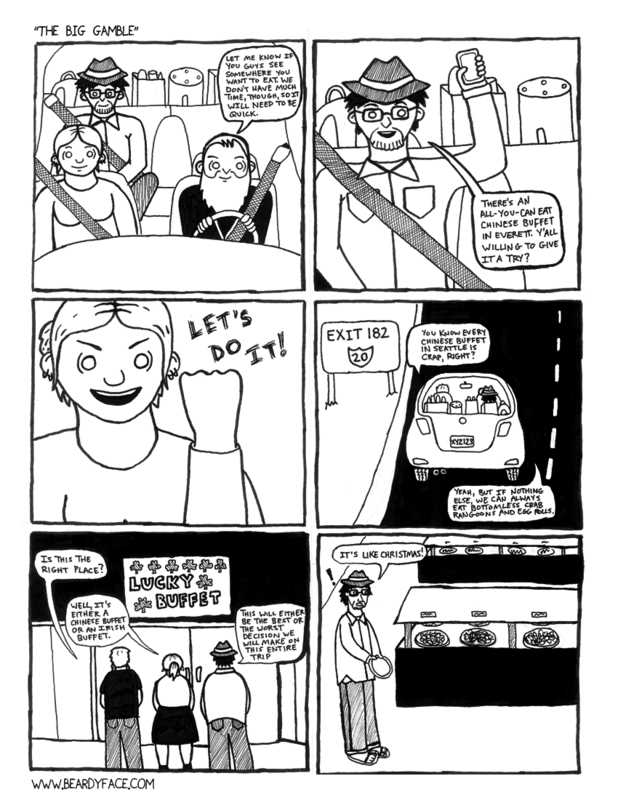 Yes, this comic really is about eating at a Chinese buffet in Everett. You have to understand, where we come from in the south/midwest, buffet Chinese food is pretty much the only kind of Chinese food you can get. I mean, you can order off the menu, but 90% of the time the server is just going to go and spoon whatever you ordered onto a plate from the buffet and bring it to you, so why bother? And the food isn’t bad. It’s not great, but it’s definitely not bad. In my adopted home of Seattle, the Chinese food is amazing (if you know the right place to go), but all buffets, of all stripes, are terrible. So, finding a Chinese buffet in a town not that far north of us that completely recreated the decent Chinese buffet experience made us a lot happier than maybe it should have, especially Andy who really misses his midwestern “meat candy”. So much so that we stopped and ate there again on the way home. Side note: This occurred while we were traveling to IslandCon, a little get-together with friends that happens once or twice a year. We go out to a cabin on one of the islands off the coast of Washington and spend the weekend playing games, cooking meals for each other, hiking, and just hanging out and decompressing. It’s a fantastic experience.